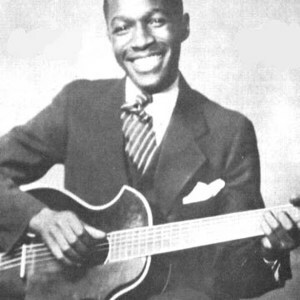 Josh White (born Joshua Daniel White in Greenville, South Carolina, 11 February 1914 or 1915; died Manhasset, New York, 5 September 1969) was an American folk, blues, and gospel singer and guitarist. White was amongst the first blues performers to attract a large white and middle-class African American following, transcending the typical barriers at the time associating blues with a rural and working-class African American audience, and performed in prestigious night clubs and theatres during the 1930s and 1940s. White was amongst the first blues performers to attract a large white and middle-class African American following, transcending the typical barriers at the time associating blues with a rural and working-class African American audience, and performed in prestigious night clubs and theatres during the 1930s and 1940s. His best known song at the time was probably "Jelly, Jelly", He recorded in a wide variety of contexts, from recordings in which he was accompanied only by his own guitar playing to others in which he was backed by jazz groups and gospel vocal groups. He was prominently associated with the civil rights movement in the 1940s. Some of his involvement in political causes in the 1940s resulted in him being blacklisted.Controversially, to escape the blacklist, he testified to the House Un-American Activities Committee regarding Communist influence in the entertainment industry and African-American community. He defended his testimony as a friendly witness to HUAC by claiming that the scope of his testimony was limited, that he did not state anything that was not already known, and that he was sincerely opposed to Communism. However, his testimony affected his posthumous reputation, which has only begun to recover in recent years. From the mid-1950s until his death, he primarily performed at folk music venues and festivals. He was seen as an influence by Ray Charles, who similarly broke considerable barriers that had hampered blues musicians in the past. On 26 June 1998, the United States Postal Service issued a 32-cent postage stamp honoring Josh White. Josh White performed the version of "House of the Rising Sun" that influenced the famous version by The Animals. He also played a version of "In My Time of Dying" (also known as "Jesus Gunna Make Up My Dyin' Bed", which was covered by Led Zeppelin as In My Time of Dying. Josh White's son, Josh White Jr., is a singer-songwriter, guitarist, actor, educator, and social activist.